Last week I wrote about why research is for designers. This week I'm sharing some ways that I organize what to research, and how to share it. It can be intimidating to think about adding yet another step into our workflow, but that can be overcome with understanding of a simple process. I have a dedicated Trello board just for research that our team needs to revisit. This board contains anything from hypothesis to details we want to test further. It helps us to prioritize and ensure nothing falls through the cracks. Sometimes we put things on this board that were prototyped but may be beyond scope, or affordances to test that may make waves wider than the feature we are working on. This board is always changing with our needs. More Data Needed - this is for things that we don’t need to make a decision on right away but will need to be made later. Often these are things we want to test or try out and the aren’t always very detailed yet. UX Revisit - These are items that have outgrown original intention and need to be revisited. Often these become future projects. To Test - These are ideas for more pure testing. A/B tests, icon metaphor testing, specifics that need to be put into a test plan queue. Measure - We are working on this in more detail that I’ll be sharing soon, but for now this has served as a reminder of measurements that need to be set up or planned for. Sometimes, a reminder goes in here for something as specific as checking up on a certain metrics for reporting when we revisit iteration on a feature. Initially, I use Evernote or Google Docs to collect notes. For example if our team interviews a client while trying out a prototype, I have a template I use to record the raw notes. Here's a template just for you! Later, I highlight notes that need to have more research done and follow ups. Sometimes the client will see the same piece again and we like to make sure we address all of their previous concerns specifically even if an idea wasn’t followed exactly and why. It keeps relationships strong and shows we are listening. After we do a series of interviews, I organize all the notes into categories. It’s smart to make sure you group them for what you’re trying to accomplish. For example, there is a difference between verifying a viable idea and confirming that an experience is something users are willing to pay for. The last time I did this, I put each raw point from my notes into a new Trello board dedicated to this design. Each note was pasted into a card and as I saw related topics I was able to drop them into related groups. Using this tool helped me have a visual idea what the themes were while hiding details of who said what inside the cards. Who said what isn’t relevant to themes of action, but are important to keep in tact. I used a coded system to help prevent bias or distraction in the event we share the board itself. After I could see patterns coming through, I decided on the following columns for organization. To really clean up the board into a digestible conclusion, I then pasted the link to each Trello card in a separate document and organized redundant notes. This greatly reduced the visual heaviness of the board since there were lots of repeating themes based on questions we asked. After I learned that you can link to archived Trello cards, I decided to archive each one and just keep the links as details inside cards as conclusions. This resulted in a much cleaner board. Links inside the card to all references of the same point. Process from notes to organized, clean research insights we can actually use and share. Lastly, I felt it was important to somehow prioritize each column by themes that were brought up the most often. I did this by creating labels to correspond with the priorities, and by ordering them this way. This also helped to create an easily scannable board with color highlighting Priority (2+ times mentioned), Medium Priority (3+), and High Priority (4+) items. 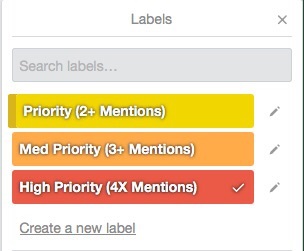 Priority labels in Trello, color coded. I would love to hear about ways that your design team has incorporated user research into your process. I hope this helps give you some more ideas and breaks down the barriers you thought existed to organizing research.